It seems I've arrived back at the perfect time from my mini break to witness the departure of another round of international football. Hopefully there won't be many injuries picked up from games last night but we'll soon find out as the players return to London Colney for their post break check-in. It was great to get away for a while, especially after the frenzied end to the transfer window and take stock of the business we've done. It was hard to lose Cesc Fabregas the way we did and for the low price Barcelona paid for him. I'm sad to see him go but had we been winning trophies perhaps things would have been different and the fee paid a lot higher. As for Samir Nasri, I think the club concluded an exceptional piece of business by selling him to Manchester City for £24m. He was never going to sign a new deal and although I believe he would have been professional in the final year of his contract and given the team his all, I think it was best for all concerned to let him leave. For their replacements - well the club got that totally wrong. Our business - regardless of Cesc and Nasri staying or going - needed to be done a lot earlier. We are effectively starting the season this Saturday already eight points down. That didn't need to happen. We all knew regardless of who stayed this summer that the squad needed straightening but we didn't get what needed to be done concluded until the eleventh hour of the final day of the summer window. As for the signings we made in the final five days, I've got to admit I'm pleased we've bolstered the squad with experienced international players rather than sign more youngsters who might emerge one day into being top players. The one question I have had since hearing the news that Thomas Vermaelen won't be training for a month is whether we knew that he would need surgery prior to the window closing or after it. If we had prior knowledge of this procedure, surely we should have signed not just Per Mertesacker but added another defender as well? I'm sure all will become clearer when the manager speaks to the media ahead of Saturday's game. We've still got options - as our confirmed list of players in our 22 man Premier League squad proves. And our September fixtures on paper don't seem too tricky. 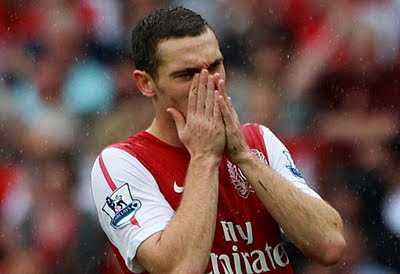 We'll be tested in Germany next week but I'm confident we'll come through it without Vermaelen at the back. We've also got to cope without Jack Wilshere, which is a blow. But one which was obviously foreseen by the deals done on Deadline Day. Hopefully Jack will come back a stronger player once he's over his "ankle" problem with all the work he's putting in at the gym. I have to say I've been left bemused by the planned protest prior to Saturday's game. I don't know enough to comment on what it's all about but will hopefully be able to give a more considered view after some more detailed research but my first reaction is why protest about something now? After the transfer window has closed surely we should be getting behind the players and supporting them through what is going to be a tough season? Anyway, I'd be happy to have links to articles about the protest sent my way so I can be better informed about what the whole situation surrounding the protest is all about. It is good to hear the chairman come out publicly and support the manager. He's got his critics but at this present time I will be supporting him. That's not to say I will not be critical of him. He has to take a share of the blame for how our summer business was conducted but I believe he is still the man to lead us. One of the manager's new signings I'm really looking forward to seeing in the red and white of Arsenal is Mikel Arteta. He's been speaking to the official site and I have been impressed with what I've heard so far. It will be interesting to see how quickly all our new signings will get up to speed with the way we play. Hopefully the training sessions this week have been getting them on the road to adapting to Arsenal's style quickly. The players who have been on international duty will return to London Colney from this morning to report in letting the medical staff know of any knocks. Then from tomorrow Arsene Wenger will have his whole squad back training together as we prepare for Saturday's match with Swansea. Hopefully the squad will be able to draw a line under the opening three league games - there is talk of a meeting to thrash out what went on after training tomorrow - and push on starting with three points this weekend.